Longtime assistant Kevin Gray takes over as the head coach, replacing Kip DeVoll, who led the team to 12 state titles. BERWICK — Kevin Gray knows he is replacing one of the most well-known and successful wrestling coaches in Maine high school history. But Gray, 37, is neither daunted nor overwhelmed with following Kip DeVoll at Noble High. In fact, he seems quite relaxed and confident. That’s because Gray has been part of Noble wrestling for nearly 20 years, first as a wrestler and for the past 14 years as an assistant coach. DeVoll confided in Gray in the summer of 2016 that the 2016-17 season would be his last. He let the team know just before the 2017 state championship and officially resigned in April. Gray was hired in early summer. Former assistant coaches Peter Bronder and Ron Zellers are staying on Gray’s staff. Bronder won over 200 matches at Noble and provides a youthful presence to the wrestling room. Zellers was a head coach at Ellsworth and Biddeford before joining the Noble staff in 2008. “So we have a consistent group of people who have been through the program or have been a part of it for a long time that understand it’s not just the wrestling piece that’s important,” Gray said. 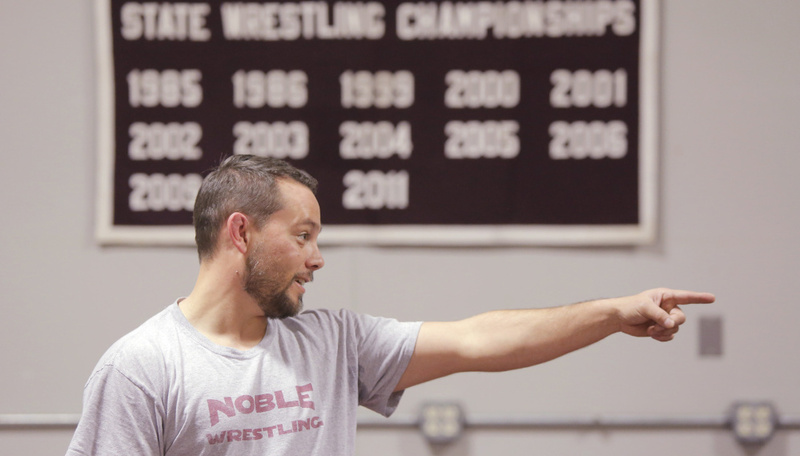 Kevin Gray has been a part of the successful Noble wrestling program since his days as an individual state champion. After 14 seasons as a full-time assistant to Kip DeVoll, who led the Knights to 12 Class A state titles, Gray takes over as the head coach. During DeVoll’s 32-year tenure as the head coach, Noble wrestling became one of Maine’s most dominant programs – regardless of sport. The Knights won 12 Class A titles under DeVoll, including 11 in 13 seasons: eight straight from 1999-2006 and, after two runner-up finishes to Massabesic, three more from 2009-2011. Some years they boasted loaded lineups and won by over 100 points. Other years there were narrow victories. Once they won a state title without a single individual champion. Throughout they were known for physical wrestlers in top condition and a no-quit attitude. But since 2012, it’s been local rival Marshwood capturing five of six Class A titles. Noble has had to settle for two runner-up finishes, in 2015 and 2017. “I think we were a little bit complacent and we lost that edge to want to be the best because we were good for so long,” Gray said. Gray isn’t about to scuttle the program he’s been a part of since the mid-1990s. Gray won back-to-back state titles in 1997 and 1998 on teams that laid the foundation for the championship years. Then he wrestled four seasons at Division I Duquesne University in Pittsburgh. He joined DeVoll’s staff as a volunteer at the end of the 2003 season and was on board full time the next 14 seasons. But there are noticeable changes in approach said senior captains John Grenier, Hil Keisker and Joe Pilecki. Kevin Gray watches wrestlers practice at Knowlton School in Berwick on Monday. Keisker said the key is to work the skill training with enough pace and effort to make it a conditioning drill as well. “It kind of raises the intensity so when you go on the mat you have more of a live scene when you’re in practice rather than just going out there, getting in shape, and practicing the moves a few times,” Keisker said. On Monday, in the Knights’ team room at Knowlton Elementary School just a few minutes of thudding take-downs got the sweat dripping down wrestlers’ faces. Gray, Bronder and Zellers were actively walking the room, offering tips and comments, with occasional hands-on demonstrations as pairs worked through a variety of moves. Noble will continue to travel out of state for competitive opportunities, a practice DeVoll started and opposing programs have emulated. And the program still has the pipeline of young wrestlers produced by two solid youth programs, Berwick Youth Wrestling, for kids living in Berwick and North Berwick, and Die-Hard Wrestling, for the Lebanon residents. With only five seniors on the 25-man high school roster, winning another state title might be a year or two down the road. But Gray is convinced Noble can return to the top. “To be honest, we want to make this program into a New England competitor,” he said.